Pluffmud Recycling was founded to offer schools, hospitals, businesses, and residents an easy and convenient way to recycle. 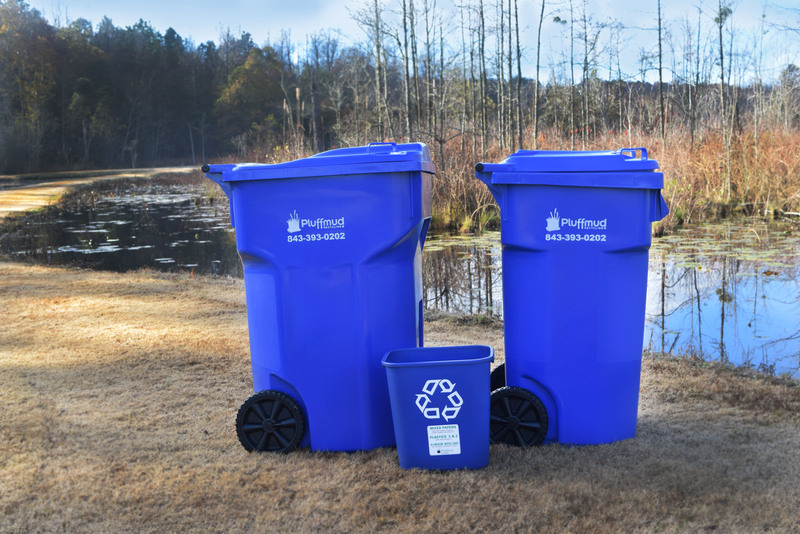 Our simple, convenient recycling service collects co-mingled recyclables from commercial and residential customers in the Pee-Dee area. We collect mixed paper, plastic 1 and 2, tin, and aluminum together. And we do all of the separating. We want to offer the easiest way for our customers to recycle. it’s that simple. Recycling. The last thing on your mind, the only thing on ours. 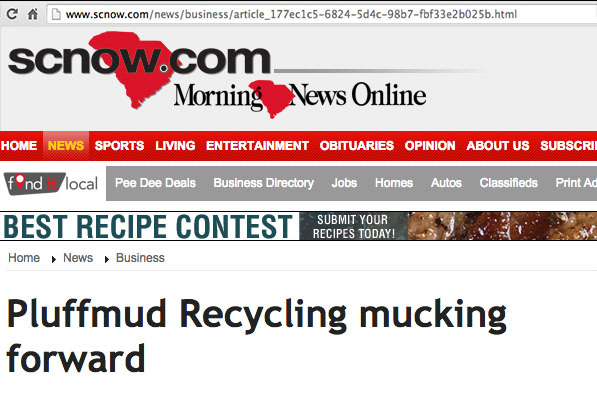 Every year, Pluffmud Recycling recognizes an organization for recycling excellence. 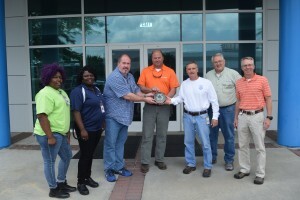 Pluffmud Recycling, a commercial and residential recycling collection service, awarded the “2015 Recycler of the Year Award” to Roche Carolina for their outstanding recycling collection program. Pictured are Crystal McAllister, Shana Jackson, Russell Misner, James Smaldone, Frankie Hunter, Brian Kistner, and Hugh Baker of Pluffmud Recycling. 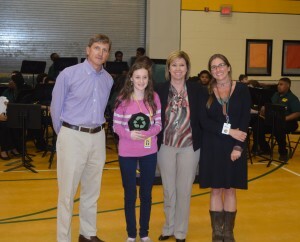 Pluffmud Recycling, a commercial and residential recycling collection service, awarded the “2014 Recycler of the Year Award” to Sneed Middle School for their outstanding recycling collection program. Sneed Middle School collects paper, plastics, tin and aluminum. Pictured are Brian Bagwell of Pluffmud Recycling, Emily Beasley, Hayley Cagle, and Lisa Perry. 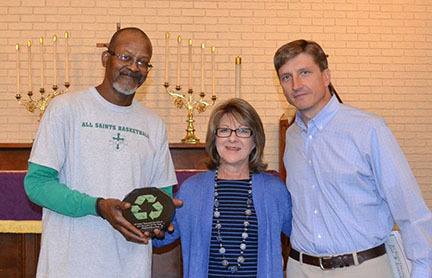 Pluffmud Recycling awarded the 2013 Recycler of the Year Award to All Saints’ Episcopal Day School. Pluffmud Recycling collected more than 13,000 plastic bottles and over 15,000 pounds of mixed paper from All Saints’ in 2013. Pictured are Evanglish Gregg and Joan Pennstrom from All Saints’ and Brian Bagwell of Pluffmud Recycling. 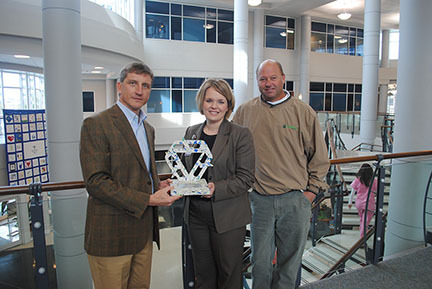 Pluffmud Recycling awarded the 2012 Recycler of the Year Award to Carolinas Hospital System. In 2012, Pluffmud Recycling collected over 50 tons of co-mingled recyclables (paper, plastics, and metal) from Carolinas Hospital System. Pictured are Tonda Haigler, Assistant CEO of Carolinas Hospital System, Brian Bagwell and Hugh Baker of Pluffmud Recycling.